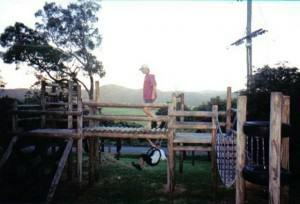 My 2 kids at play! wandered back to camp. It was New Years Eve and we settled back with a bottle of bubbly (as you do), a wonderfully clear night with billions of stars on view, and quiet neighbours. What more could we ask? 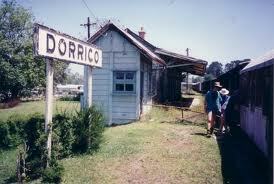 Dorrigo. The name has a ring to it. 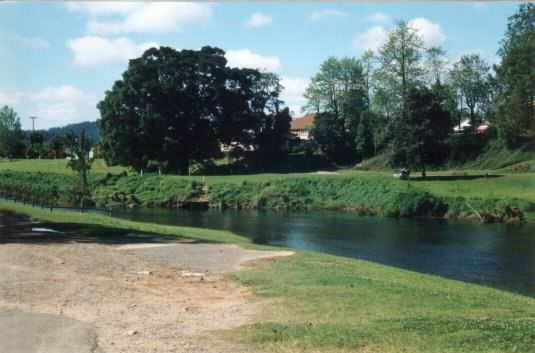 Although most historians agree that the first white person to see the Dorrigo Plateau was an escaped convict named Richard Craig, in the 1830’s a Major Edward Parke was exploring the tablelands of the Clarence Valley with a view to settlement when he discovered this picturesque plateau. He was a veteran of the Peninsular (Napoleonic) Wars and served under the Spanish General Don Dorrigo, a person he greatly admired. 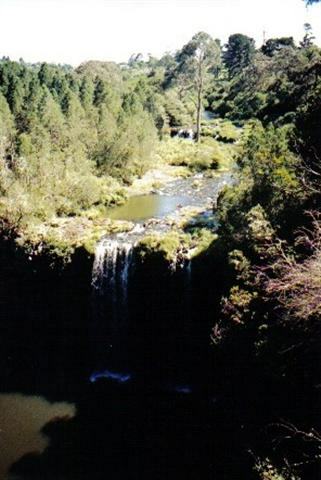 To honour his old comrade he named the eastern portion of the plateau “Dorrigo”. There is a minority belief that the name was derived from an Aboriginal word but there is no evidence to support this. 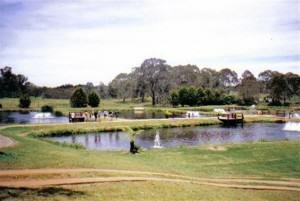 Parke established a cattle station on the plateau with Sir Maurice O’Connell who later became the Governor of Queensland. Over the next few years pioneering families began arriving and gradually the settlement grew. 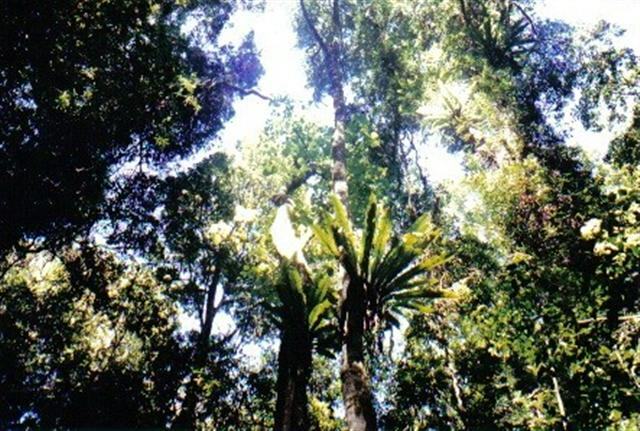 The rich and fertile farming land attracted many settlers and the abundant forests provided the timber industry with a variety of trees including Antarctic Beech, a timber in very short supply as it only grows above 3000 feet on the plateau. Settlement of the scrub country began in earnest in the late 1800’s. Dairy cattle were brought in and crops were planted in the rich red basalt soil. Dorrigo was on its way. Dutton Trout Hatchery. 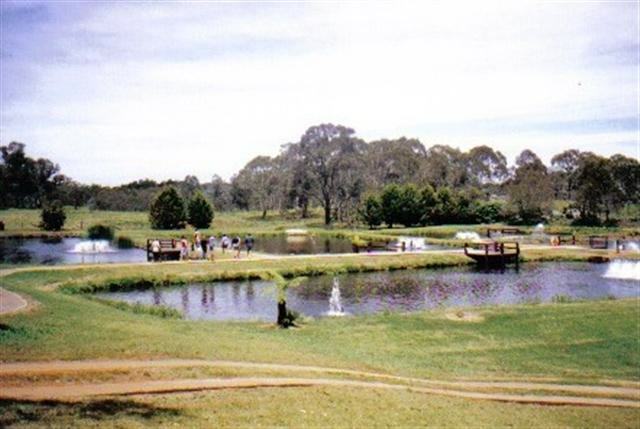 Ebor is a 45-minute drive along the Waterfall Way and then another 15 kilometres (9 miles) further on is the hatchery where our first stop was to see a short film on the history of the place and what they do here. Then it was out to the actual hatchery and fish tanks. An interesting place and feeding these fish was an adventure. The fish are huge and they quite literally jump out of the water to get the food. Makes the shark from “Jaws” tame by comparison! We walked around the various ponds and tanks, feeding the fish, and learning more about trout than I’d ever wanted or cared to know. It was hot and horrendously humid and we didn’t stay too long. And, in any case, I personally think if you’ve seen one fish tank, you’ve seen them all! John and Sean were fascinated but it wasn’t to my taste. 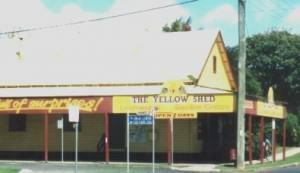 Dorrigo township. It was quiet and peaceful at the lookout with birds chirping away and a soft breeze blowing and you tend to forget that in the winter there is often a dusting of snow here and many of the waterfalls freeze solid. Now that would be something to see! We returned to Ebor for lunch and our choice of what to eat was made easy by the fact that only the café in the petrol station was open. 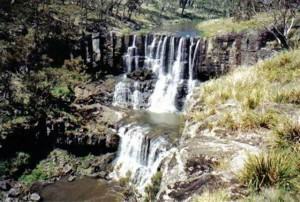 After lunch Ebor Falls beckoned and we weren’t disappointed. What a magnificent sight. The water cascading from both the upper and lower falls was so clean and clear that it sparkled in the sunlight. We followed the path around the escarpment to get the best angle for photographs but no matter where we stood the scene was still awe-inspiring. The falls are not big, by some standards, nor could they be said to be majestic. In fact, they are quite small in comparison to others, but the sight of them flowing over rocks made smooth from eons of rushing water was fascinating. Legend says that this water has been falling since the Dreamtime, the beginning of time according to Aboriginal folklore. On the way back we decided to take what we thought was the scenic route and followed the Deervale Loop Road. Well, the tourist guides got it wrong this time. It was all a bit ordinary although some of the views were nice. But compared to what we had seen so far on this trip it was a long way down on our list of places we must return to. About the most exciting part of our drive along the Deervale Loop Road was unintentionally chasing a jackrabbit down the road. Back in Dorrigo we paid a visit to Dorrigo Pottery where John got into a conversation with the potter (and he thinks I can talk!). But the pottery there was exquisite and, of course, all hand-made. A quick drive around the rolling stock of the proposed train museum and then it was on to Dorrigo Woodworks. Some of the furniture and carved items here are amazing. Carved out of tree stumps, branches, if it’s a tree they can make something out of it; they’re almost works of art! By the time we returned to camp we were exhausted; it was an early night for all of us but it had certainly been a good day. Cloudy and cool the next morning but it didn’t take long for the clouds to burn off and the temperature to begin its upward climb. you are entering a world of art and craftworks from some of the most talented people on the north coast. I was particularly taken with some Aboriginal pottery and paintings and after much umming and ahhing finally settled on a small plate with a painting of a platypus on it. But it was all so good and almost too hard to resist. John kept telling me “They don’t take American Express here!” He’s no fun, is he? We wandered through the main shopping area looking in shops and just generally taking our time; we were in no particular hurry, but Bellingen is a small town and it didn’t take us long to walk from one end to the other. was more than enough for us today. But if you’re in to walking then this is a great place to do it. It would take hours, if not days, to tramp all the trails and tracks here but it would certainly be worth it. The rainforest is truly magnificent and we were amazed by the sheer size of some of the trees, not to mention the possibility of sore necks from looking up so much! We followed the well-travelled walking track through some of the most beautiful forest we’d ever seen, occasionally seeing some bush turkeys or other birds in the bush. High in the trees there were king parrots, green catbirds, and satin birds. Most of the mammals in the area are nocturnal so we didn’t see any of them but there are also some reptiles like pythons and I’m glad we didn’t see any of them either! The track continued around through the rainforest and before too long we were in The Glade picnic area. Well laid out paths led off in different directions and we took the one that headed back to the Rainforest Centre. Not a long walk as bushwalking tracks go but enough to give us a taste of the forest. Not to mention sore feet and out of breath! have a look at where it all started. 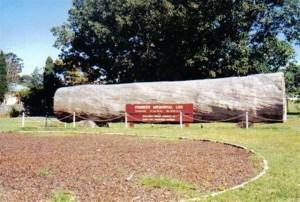 The Pioneer Log is from a tallowwood tree and has an average diameter of 170cm (67 inches) and a volume of 20884 cubic metres (737511 cubic feet). It is estimated that this was the amount of timber required to build one Australian cottage during the pioneer days. The photo does not do justice to it; it was one heck of a tree. I caught up to my boys and a little after 10:30 we left Dorrigo and headed northwest through some absolutely stunning scenery. Lush, green pastureland, spectacular hillsides dotted with trees, fat cattle, and lovely old farmhouses, over fast-flowing creeks and rivers of sparkling clear water. There’s nowhere else in the world quite as beautiful as the Australian countryside.